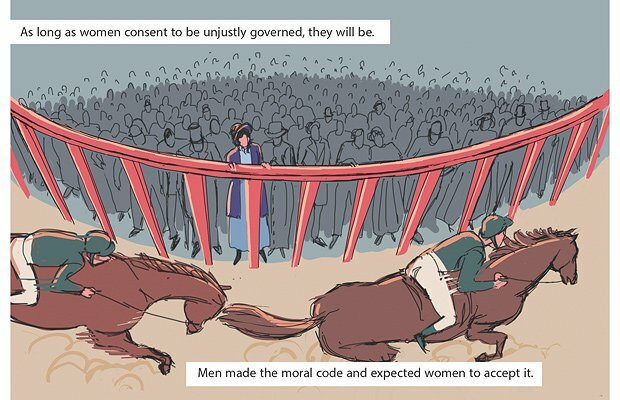 A collaboration between two notable new names in the Scottish publishing scene, We Shall Fight Until We Win sees 404 Ink team up with BHP Comics to deliver a punchy comic anthology that puts the spotlight on political women. From Sophia Duleep Singh and Emmeline Pankhurst to Dianne Abbott and Nicola Sturgeon, the book covers pioneers throughout the decades. Each featured trailblazer has a different creative team and the writers and artists include Denise Mina, Sabeena Akhtar, Hannah Berry and many more. As the anthology begins to hit the shops, 404 Ink founders Laura Jones and Heather McDaid fill us in on the inspiration behind the project. We Shall Fight Until We Win celebrates pioneering political women, where did the inspiration for the project come from? Heather: It actually started at the Edinburgh Book Festival in 2017 – Sha Nazir from BHP Comics approached us about working together on a project in this vein and immediately we knew it was a project we wanted to be a part of, and BHP a publisher we'd love to work with. 2018 marks the centenary of the first wave of women gaining the right to vote in the UK, so it was an ideal time to look back on 100 years of political pioneering women – it was very much in line with BHP's Mighty Women of Science and our book Nasty Women; we both love these respective titles, and were happy to do more within the area of celebrating and exploring feminist topics. Tell us a bit about the experience of partnering with BHP Comics – were you on the same wavelength or was it a case of each bringing something new to the table? Heather: A bit of both: in terms of content, we were both very much on the same wavelength but we have different skillsets – we at 404 were always interested in publishing comics, but don't have any substantial experience in that area; BHP bring an expertise that's unrivalled in Scotland for their work with comics and projects of this sort. We knew we could bring extra marketing clout through running another Kickstarter similar to what we did with Nasty Women and keep that pressure off of BHP who did the legwork in getting all the comics in on time! How did you choose which women to feature? Was it the creatives who pitched or did you commission particular stories? Laura: We came up with quite an extensive list of potential subjects, all divided up by decade, so we made sure to have at least one representative from each decade. We invited the contributors to peruse this list and pick who they would like to do, or suggest their own if we missed any. We wanted to start from the suffragette movement with Emmeline Pankhurst and Sophia Duleep Singh, and give a good overview to some key figures that people know, and others that are perhaps less-known. Sabeena Akhtar said very early on she would like to do a feature on those excluded from the vote, or the unsung heroes like mothers who remained excluded from voting but continued on with their lives, unwavering and determined for justice. 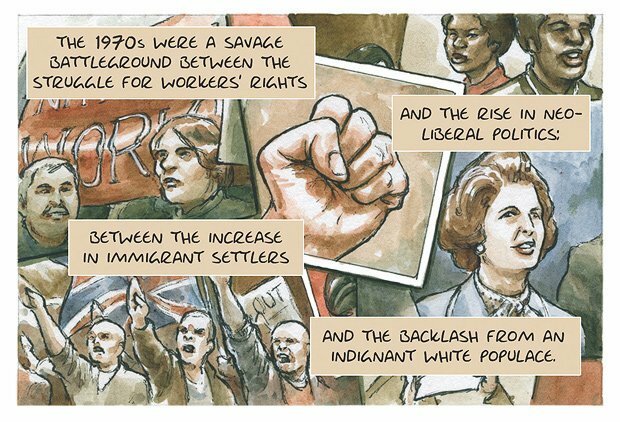 We also had to master a balancing act in that we knew we couldn't publish a book about pioneering political women that wasn't wholly and honestly representative of the political party climate in the last 100 years, which of course meant acknowledging Margaret Thatcher and her legacy, however you may view it. 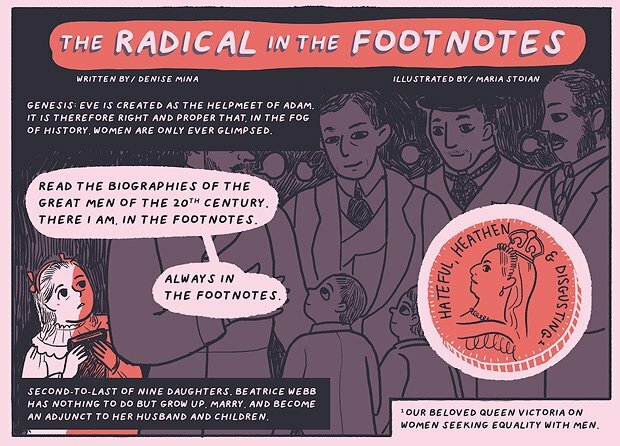 We did our best to represent her in the most honest way possible, in that she was highly questionable as feminist figure and prompts the reader to acknowledge the imperfect practices amongst the successes throughout feminist history. Heather Palmer and Rebecca Horner did a fantastic job with such a challenging subject. You're well versed in compiling anthologies, how did you find the process of adding artists into the mix? Laura: Really refreshing! It felt unusual to, in many cases, match a writer with an artist they had never met before, let alone created an artistic, political piece with before. We're so glad they all took to it like ducks to water and came back with some of the most inspirational collaborations we've seen. The quality and range of artists that came forward from our open call along with the regular artists that BHP have worked with was outstanding. Some may be well known already and some less so but we loved that such different, high quality styles were coming our way. We Shall Fight Until We Win is so varied and eye-catching because of it. It probably revitalised our excitement for working with new writers and artists all over again. How did you find using Kickstarter? What opportunities does it open – and does it provide you with any unique challenges? Heather: We've both used Kickstarter before and think it's the best way to get a book out there, when it's the right project. Kickstarter allows you to rally people behind a project, raise funds quickly to cover the cost, and helps you reach a new and international audience. For us, we didn't think we'd go back to Kickstarter after Nasty Women – it can be all-consuming and stressful, but we felt We Shall Fight… was the right project to return to and this time around was one of the most stress-free months we'd had in a while! The challenges are really making sure it's a title people want to get behind – why does it exist? Is there a reason it's being funded this way? Is there a reason it has to come out so quickly? We have a checklist of criteria that a book needs to match before we go the crowdfunding route given how much time and effort goes into it. You're planning to donate copies to particular organisations as well as offer it for sale, please tell us more about the decision behind that. Heather: We Shall Fight… is there to showcase stories of women – some well known, some less so, all worthy of note. When it comes to boosting stories, we don't like the idea of it being exclusive. Everyone should have the right and ability to access history, knowledge, information. We know not everyone can afford to buy books at full price, so we wanted to give people the option to donate copies to organisations of their choosing – schools, libraries, charities. We think We Shall Fight… is a great starting point for a lot of women you don't hear about in history class, and get lost in the noise of 100 years. We've also set up weshallfightuntilwewin.com as a Kickstarter stretch goal – we hope this will become a resource that complements the graphic novel, not only covering the women included, but branching out to cover more women's stories over time. On top of being able to grow beyond the graphic novel, it's a free resource for people too. We're still in the process of organising these being sent out, but it's been really nice to be able to reach out to places about donating a copy! More information on donating copies can be found online. We Shall Fight Until We Win launches in Edinburgh at Waterstones on Monday 18 June and will also appear at Edinburgh International Book Festival on Saturday 11 August.